"What do you have to hide?" 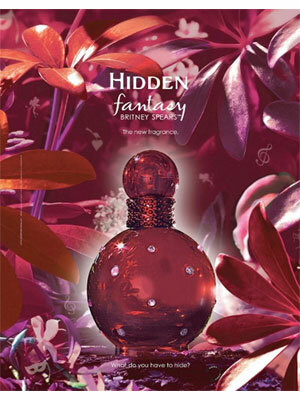 Hidden Fantasy Perfume by Britney Spears, launched in 2008 by Elizabeth Arden. "A sweet nectar of sparkling citrus blossoms, succulent florals and mysterious musks shares a secret of warm sensuality that is impossible to hide." 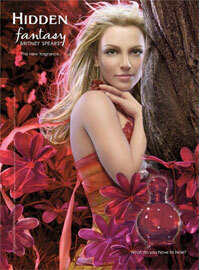 Available in 1.7oz and 3.3oz Eau de Parfum Spray. A sweet nectar of sparkling citrus blossoms, succulent florals and mysterious musks shares a secret pf warm sensuality that is impossible to hide. Powerful emotions are ignited with a burst of Sweet Orange and Tangerine that lie intimately alongside delicate Grapefruit Blossoms and French Flowering Verbena. Napolitano sweetness tempts you as the wild floralcy of Stargazer Lily and Sambac Jasmine is embellished with sensual Clove. Your hidden fantasies come alive with an intriguing finish of Mexican Vanilla Bean, Jacaranda Wood and Fluid Sandalwood, enhanced with the radiance of Amber.